Sr Brown isn’t a breeder. This is not an issue to him. Your argument is invalid. Sr Brown isn’t a breeder. Is that fairy dust I can smell? Everyone should read the Greens policies, they are more or less the same as the Communist Manifesto. They say they are environmentalists, but that is not their agenda, it is purely political. Its not climate, but OUR FREEDOM that will be endangered. It is of real concern that the Greens have the balance of power in the Senate from next week. They are intent on ruining Australia, Australians seem oblivious to their real agenda, even those who do not vote for them. We need an election now, to boot out the Greens & their alliance with Labor, The most disgraceful union in Australia’s history. Julia Gillard did a deal with the Greens so she could have the keys to the Lodge. This will have disastrous consequences on Australia. Anyone who cannot see this is very foolish. Despite Julia Gillard’s promise of transparency, there is no mention of what she bribed the Greens with, in order for them to sign up in league with her. It is the Greens who are now calling the “shots”. Gillard sold Australia out. WAKE UP AUSTRALIA BEFORE IT IS TOO LATE!! How can an organization (the Greens) or political party who have one seat in the Australian parliament be in a position to “have the balance of power in Senate from next week”? I am new to Australia and obviously do not understand how the Government, parliament and senate is made up of and what their respective power, authority, accountability, influences, etc. are. Excuse my French; sounds to me like a f*cked up system. Maybe we now know what the idiotic GREENS mean now with the green jobs of the future. We will all be wrapping and parcelling boxes Sunlight and Wind to export and create what could be called the “wind & sun going and coming out of your a***” industry. You are preaching to the converted here, (me at least, anyway). I think a lot of people voted Green as a protest against Labor and Liberal. You are right, a glance at some of the Greens policies should be enough to set off some alarm bells with most sensible people. There is nothing wrong with having ideals and principles, and being able to express them, but ruining a national economy in the process is sheer silliness. Fact: ‘Renewable’ energies are the stuff of fairy tales. Wind turbines, solar panels, geothermal, tidal, wave, biomass etc etc are all, not only expensive to produce but are inadequate and only supply intermittent power with current technologies. They are not a sustainable solution to meet consumer demands and they still all require a back-up of coal or nuclear power. Fact: The Australian Greens oppose any form of nuclear power and they believe that ‘Australia needs to plan for a future that does not rely on coal export and coal fired electricity’. In other words, the Australian Greens want to decimate our economy and living conditions by replacing coal fired power stations with ….. fairy tales!! I totally agree – WAKE UP AUSTRALIA BEFORE IT IS TOO LATE !! I disagree that Sen. Brown has made an idiotic statement, it is policy and it is definite. And from July 1 they take control of the Senate with the likes of Sen. elect Lee Rhiannon. It’s just that Sen. Brown appears to make idiotic statements. As someone said previously; should be called the “Reds” instead! Well they don’t take control of the Senate because if the opposition and the government vote together what the greens do will not matter.It is only when the opposition and the government disagree that they hold the balance of power. In the recent Government TV add Darryl Kerrigan asks “What if we say yes.” The travesty is that we’re certainly not going to be asked and next week the lunatics get the keys to the asylum! Another big step along the road to Australia becoming the poor white trash of Asia. Prime example of rectal wisdom…. Has anyone done a comparison on the replacement of coal fired power stations with wind farms ? I have done a ‘back of an envelope’ set of calculations on just the coal fired power station in NSW, basically to do with noise generated. The total electrical energy by coal fired generation in NSW is 12,007 mega watts on a contiual 24/7 basis. 8 metre/sec wind speed (28.8 kph ) generates 1,400 kw or 1.4 mega watt o/p. Noise level 106.5db – nearly compares to a snowmobile or jackhammer. To get an equivalent power to the grid would require 12007 / 1400 = 8576 wind turbines assuming a continuous wind speed. The noise level table used is from Visicomm Industries on industrial noise. The noise generated is mostly in the infra sound range, mostly below human range but still has effects on human systems, including hearing damage and disturbed sleep. The hub height of the propeller on the turbine is 130mtrs. The output assumes a 24/7 source of 8 metre/sec wind (which of course is not practical), so base load energy is required to fill in the gaps. Wind turbines also require power to keep computer systems on line, hydraulics operational, and if in a cold position power to keep hydraulic, lubrication and transmission fluids viable. To sum up – over 8500 wind turbine units to replace 8 coal fired power stations, and would still require backup power to give continuous 24/7 electricity. Turbine blades also destroy birds, mostly soaring birds such as raptors such as eagles, kites. How about investment in research and then installation of Thorium power ? If it’s good for China, India and now the US, why not ? We have the Thorium, and it is far safer than uranium and it’s byproducts. It also does not easily supply materials for weapons use. When will the Liberal Party have the courage to ‘come out’ and make public what I for one (and many others) know – that senior members of the Liberal Party know “AGW is a complete fraud – a crock”? Their colleagues in the National Party have told them. They have been handed the incontrovertible evidence that the IPCC and its antecedents have corrupted climate science. They know that so-called climate scientists and all their hangers on continue the scam in order to continue the veritable flood of grants money out of the Dept of Climate Change and Environment. That the atmospheric concentration of CO2 is a consequence of temperature change – not a cause. etc etc etc. Come clean Liberal Party!! Failing to declare the truth is to be complicit on the lies. If you aspire to leading this Nation show the voters courage. They will reward you. Gutlessness at this stage will shorten your term in office. Are you only hell bent on ensuring that you have such a landslide victory at the next election that you remain in power for many many terms of parliament? If so you are deceiving yourselves. Are you prepared to place the future economic well-being of this wonderful nation into jeopardy by not having the courage to state the obvious? We are being conned!! Sure you will be the brunt of (corrupted) media. Please take courage. Stop listening to polls. Australians are desperate for genuine leadership on this critical issue. Allowing a Greens dominated Senate to flourish and take us into economic oblivion after 4th July is just not good enough. Mr Abbott: It’s TIme!! – to declare the truth. Climate Science has been massively corrupted. You are absolutely right, I have just sent your complete message to Tony Abbott. I agree with you entirely. Many thanks for putting it so well. Why is it that Labor/Green politicians manage to be so utterly wrong about everything? The answer is quite simple. They’re just stupid! They’re not interested in facts. They just want to construct their pretty little narrative about the world, regardless of whether or not it has any bearing on reality. And then they want to dump it on us… and ruin our lives in the process! Actually, people like them are not just stupid… they’re evil! 3. Evil Conservatives – led by the likes of Alan Jones and Andrew Bolt – are deliberately spreading confusion about Climate Change. 4. People opposing the catastrophic man-made global warming political dogma are “anti-science”. I would believe that the Liberals are well and truly aware of the science and the ramifications of a carbon tax and an ETS. This page from the LIberals site shows they are well aware also of the UN Green Climate Fund, which will strip 10% of a carbon tax or (shudder) an ETS as a committed regular payment to the UN. – Parliament question time – Julie Bishop MP asks the PM about the UN Green Climate Fund – and gets a non answer. Note also this is followed up by the giggling Rob Oakeshott before ending. So he is also aware of the Green Climate Fund. Notice also the impartiality of the Speaker. – Parliament question time – Julie Bishop MP asks the Treasurer about the UN Green Climate Fund – and gets a non answer. So the coalition may have the information, but they lack the numbers. Bob Brown does have an answer: Today he said in his National Press Club address that Jobs lost when the mining industry is shut down will be taken up by the MANUFACTURING INDUSTRY!! Hey Bob, closing the mining industry will kill much of the manufacturing industry that the union movement hasn’t already killed by demanding conditions such as employers being forced to pay workers a “17.5% bonus” to go on holidays!! When I listen to Bob Brown, the word “treason” comes to mind! A solution to those who don’t want either Gillard or Abbott as PM: demand a private members bill be passed to prevent polititians born outside Australia from becoming PM! Problem solved!! 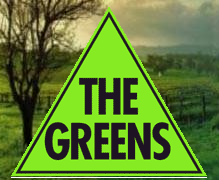 it amazes me time and time again just how stupid these greens are ….how the bloody hell did these guys and woman get into power …..ill tell you how …..the people who voted for them are even more stupid than they are. have a look at australia we used to be a proud , wealthy nation of strong people we have become the laughing stock of the world and also the welfare handout country for bludgers ….the people that fought for this country and help build it have been ridiculed for being racist , idiots blah blahh blah, so what does that make the idiots we have running this country now….sometimes i am disgusted with what we have become and the worst part of about this is that if nothing is done to stop thhe greens and gillard there will be no turning back ,it will be all down hill from here.